30 weeks - 7 weeks to go! Finally in the "30's"! Just Matt and I went to the appointments, left the girls back at the family house with Grandma. 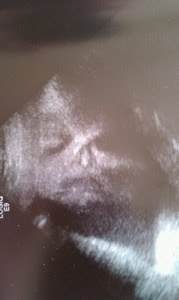 Sonogram- Just a quick one. Results given to us by my OB said ventricles were stable (or maybe slighly improved?? ), and everything else looked good. They don't do detailed measurements everytime, next time will be in early August. OB Appt - went well, we met Dr. Robertson again, I see her for most of the appointments and really like her. Nothing exciting, got put on antibiotics 4x a day for bladder issues, I think they were just being overly cautious since I am "high risk". Gained some weight this time. BPP/Non-Stress Test The BPP (bio-physical profile) went really well, the testing nurse does a quick sonogram to look for fluid levels, baby movement, baby leg movement, and breathing movements. She passed everything really quickly. She was really active today so they had a hard time keeping her on the monitor. Glad everything is still going well! I can't wait to get your updates each week. I got the books you sent here for me, thanks so much. You don't even know what a burden that lifted off my shoulders - Lance could barely get my suitcases closed, even without all that stuff! Your girls are adorable. I'm glad I could meet them - now I just have to meet Ruth! Congrats on making it to 30 weeks! I never did see Dr Robertson. I only saw Dr Wu. If you see him tell him I said hello. I miss everyone there! Good luck and have fun, eat lots! Loved all the good food there!